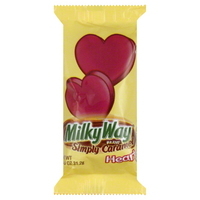 Milky Way simply caramel hearts are a new Valentine candy this year. I have to admit these are simply delicious. Every year candy companies come out with a holiday version of an everyday candy. Simply caramel hearts are a version of the simply caramel candy bar. Have you seen these at your local supermarket or chain stores ? Have you thought about giving them a try , but haven't. Well I suggest you do as they are quickly becoming one of my favorite Valentine candies. If you have never tried this you are probably wondering what they are. Well they are simply caramel and chocolate. There are other caramel filled hearts available, however I haven't tasted anything quite as great as these. You get a melt in your mouth chocolate heart when you bite into it the thick chocolate shell will snap. Once getting inside you reach a creamy gooey soft caramel. Don't be surprised if you end up with caramel on your chin or face. These are somewhat sweet and eating more then one at a time could be a challenge but one you will enjoy. Don't let the name Milky Way confuse you as they are different then the traditional candy bar. Unlike the candy bar this are only chocolate and caramel with no nougat what so ever. Although these are a spin off of the simply caramel candy bars I found the milky way hearts to be better. The caramel in the hearts is a lot softer, these remind me more of a carmello candy bar. Each heart is 1 oz of chocolaty gooey goodness. You can buy them in a full box of 24 or just one Milky Way caramel heart if you want to give them a try.